Great for multi-user/public workstations to accomodate both left and right handed users. Helps prevent RSI/injury issues by allowing seemless switching between hands. Freeware! no ads, no nags, free software, suggestions appreciated! Last edited by gwarble on 26 Sep 2018, 19:37, edited 19 times in total. v0.48 - - No external files created! Last edited by gwarble on 02 Oct 2014, 01:00, edited 5 times in total. Location: Somewhere in the northern hemisphere. I use it all the time to set different mouse wheel speeds for different mice. I have corded mice that scrolls super slow, but then my wireless mouse goes at hyper speed when I adjust the speed for the corded mouse. I also use both mice in multi-cursor mode sometimes for my two monitors. I'm using this software to be able to set different cursor speeds for my mouse and my trackpad. Happy with it so far. Recently it started showing this message about updating, something like "Click here to update... latest version: 0.5987", but when I click on it nothing happens. It also mentions an eithermouse_update.exe file, but I can't see it anywhere... :-? I need to adjust the orientation of my Left hand mouse 180 degrees, but leave the Right hand mouse in its default orientation at the same time. Could I get tips on how to accomplish this? Finally find a software deal with Multiple mice , individual settings. I have a stupid handheld trackball which I hope make forward , backward buttons work as left and right buttons. And make left and right buttons do the forward , backward. When play games I use normal mouse not trackball. There are many ways to redefine buttons, but all of them work on all the mice at the same time same setting. Is it possible to add more buttons swap else than just left and right . Thank you, this made my day. I cant believe this is the only way to match up the speeds of your mouse and touchpad, seems like such an important feature with laptops, and no one else has done it. Can you give even more sensitivity to our mouses (more than 20) ? I have one mouse maxed out but I still would like more speed. I wasn't sure if this was the appropriate place to make specific requests for EitherMouse. Anyway, I really like the tool, and it's solving a bit of a nerd need. I'm using it to run Virtual Table Top software for RPGs on a single machine. First monitor, I control what the players see. On the second monitor that interact with 'tokens'. I would really like for each player to have their own mouse, and limit their ability to accidentally go off screen to my main monitor. Today we just do this by passing the second mouse around to the players. I was wondering if it would be possible, or even that much harder to add this? Likewise, the only other thing I could think of is the ability to lock a mouse to a specific monitor. I actually 'accidentally' found it it already supports more than two mice last night when I bumped the track pad on my laptop. All of a sudden there was a mouse3 cursor on the screen. I was going to experiment with this more. Is the source available somewhere (SF or GIT), and what is it written in? I'm fairly familiar with VB and C# .NET. I recently acquired a new Windows 8.1 64-bit laptop. After installing EitherMouse 0.5897, the settings for mouse, double click, and wheel speeds are all disabled (see attached screenshot). The sliders are dark, and cannot be moved. Everything above those three sliders appear to work fine (swap buttons, multi-cursor, etc). The issue persists for touchpad, usb, and bluetooth mouse. I tried running EM as admin but still get the same results. I think I had this issue before on my old computer some time ago with a previous version of EM, but I don't remember the fix. It may have simply been an update. To add to my woes, the links to previous versions are all dead (404)! Thank you for excellent software. I have never seen real 2 mice working at once before. I have probably stupid question about modification of your program. 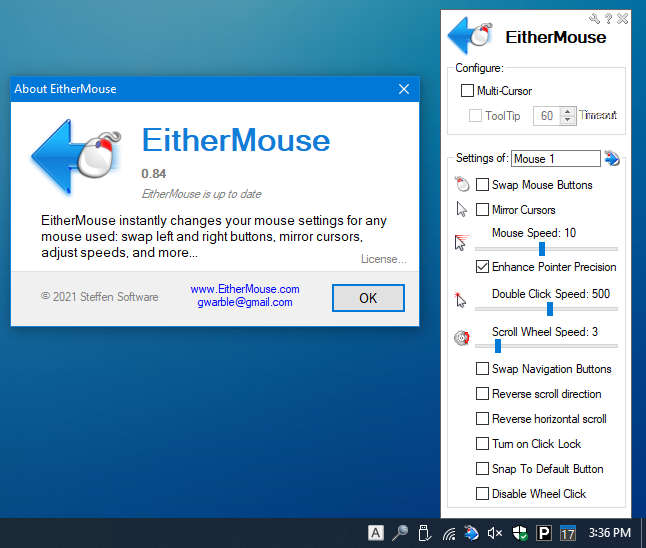 Installation of EitherMouse includes .ahk files (EitherMouse.ahk etc.) that, I suppose, meant to be compiled into “EitherMouse.exe”. After compilation using Ahk2Exe.exe (as I did with my previous very simple scripts) I have got exe file. What should I do? Do I need to find those icons and put them in the same folder with EitherMouse.ahk? I would really appreciate if you will share those icons or if you will give any ideas about this error or compilation. Bort wrote: I recently acquired a new Windows 8.1 64-bit laptop. After installing EitherMouse 0.5897, the settings for mouse, double click, and wheel speeds are all disabled (see attached screenshot). The sliders are dark, and cannot be moved. Everything above those three sliders appear to work fine (swap buttons, multi-cursor, etc). Thank you so much for making this. It is exactly what I need but I need it for the mouse speed settings. Not the right and left handed swap. Excellent. That did work. I wasn't super hopeful that it would because it looked like it was grayed out but when I tabbed down to it I could move it with the arrow keys. This is on my Lenovo Yoga 2 Pro which has a QHD screen (3200 x 1800) resolution. It's actually fairly common that I run into programs that have issues with the high DPI screen so I should have thought of that. It should be a relatively easy fix to change the size of the sliders to be a size that is relative to the system detected DPI right?